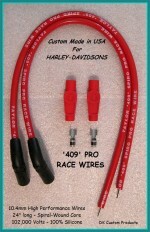 RED 409 PRO RACE Spark Plug Wires for Harley-Davidsons. Perfect for our Coil Relocation Kits! Perfect fit for our 95-03 Sportster Coil Relocation Kits! Red 409 PRO RACE Spark Plug Wires for Harley-Davidson Sportsters with V-Coil Relocation Kits. 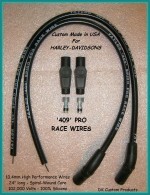 Black 409 PRO RACE Spark Plug Wires for Harley-Davidson Sportsters with V-Coil Relocation Kits.